Connected speakers were everywhere at CES. Companies like Sony, (S SNE) Panasonic, Pure and numerous others all showed off loudspeakers that can stream music directly from services like Spotify and Rhapsody, without the need to pipe music via Bluetooth from a mobile device. But as more and more vendors come forward with their own take on connected speakers, music services find it increasingly hard to pick and chose. Pandora’s (S P) CTO Tom Conrad told me during CES that his company has gotten requests from “a couple dozen” speaker makers over the last few months. Some of these companies want to go down the Sonos route and build their own app to control all the music that’s playing on their device — not an ideal scenario from Pandora’s perspective. The company has put a lot of work into its mobile apps, adding music metadata and other features, and all of this would be lost if someone accessed the service through a third-party app. Other companies, including Pure and chipset vendor Qualcomm, (S QCOM) come with a different proposal: They want to add a “play to” button to Pandora’s app, which would make it easy for consumers to beam music straight from the app to their connected speaker. It’s a much better solution on the surface — but it comes with a significant downside: Every of those few dozen companies uses different technology to beam music to their speakers, complete with a unique SDK to add the technology to apps like the ones made by Pandora. 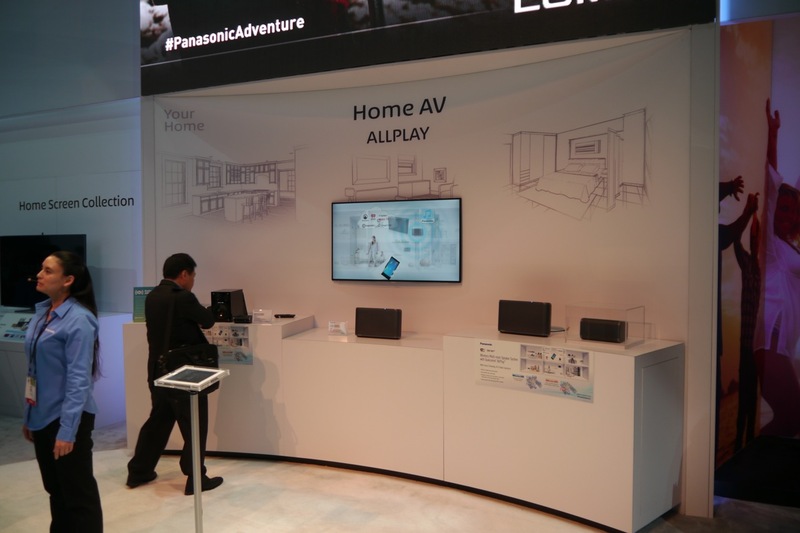 Panasonic was one of the many companies showing off network-connected speakers at CES 2014. Adding all those SDKs to the Pandora app is simply impossible, picking and choosing the right ones is just as hard in a market that is still in its infancy. That’s why Pandora has been saying no to almost all of these requests, Conrad said. In a way, the connected speaker market is very much where Smart TVs were two or three years ago. TV manufacturers and companion box makers like LG, Roku and Panasonic all had their own platform, and each and every one of them built their own, customized version of a Pandora app to ship with their devices. The result were apps that looked different on every TV, and that hardly ever received any updates, even as Pandora’s service evolved. Pandora solved this problem by launching an HTML5-based TV app last June. Not only does this new app look and feel the same on a variety of game consoles and TVs but it’s also easily updatable, because it’s essentially a web app hosted on Pandora’s servers. So when more and more speaker makers started knocking on Pandora’s door, the company came up with a crazy idea: What if it treated loudspeakers just like TVs? What if connected speaker manufacturers integrated an HTML rendering engine into their speakers, capable of playing content from Pandora’s web app, just like any connected TV — with the only exception being that speakers obviously don’t have a display? In other words: What if there was a browser in every speaker, capable of running simple web apps? Conrad demonstrated approach with two connected speaker prototypes built by a San Francisco-based startup called Beep, and the experience essentially looked just like Chromecast, without the TV. He played a Pandora station on his mobile device, then pressed the same button that’s also being used by Chromecast, selected the web-connected speakers instead, and music started filling the room. Conrad told me that Pandora started toying with this vision of HTML5 web apps for connected speakers even before Google unveiled Chromecast, but that it has gotten a lot easier to explain it since. “The ideal model is kind of this Chromecast model,” he said. There is another interesting parallel between Chromecast and Pandora’s proposal that goes beyond the look and feel of the integration into mobile apps. While Chromecast is obviously a Google-built (S GOOG) device, it’s worth noting that some of the underlying technology, dubbed DIAL, was actually built by Netflix and YouTube, and that both have been successfully pushing TV vendors to extend this kind of multiscreen functionality to other devices. It’s interesting that Pandora as a content company pushes for the same kinds of standards in the connected audio space, and if DIAL’s rapid adoption is any indicator, then there might be a chance that Pandora will actually succeed. Image courtesy of Shutterstock photographer Ensuper. Having experienced it, the Chromecast architecture is better. Use the end point devices (mobile, static, embedded, wearable, whatever) for control (meta-data) and let the device itself otherwise be yet another IP enabled device. We need only IP and upper protocols for distributing streaming media. Let the rest die. Physically at this time we need only WIFI, and wired Ethernet. Let the rest of the digital cabling and signalling technologies die. IMO, no wireless audio model is complete unless it can deliver what Sonos has: True multi-room audio that can offer perfectly sync’d sound when you want and completely independent sound when you don’t. Anything less is a compromise. But there’s no reason that a speaker system can’t do that while also using a web app to access the music. I don’t think Sonos’ multi-room model matters beyond a tiny slice of the market. Users want wireless docking with the native UX on smartphone.